February 01, 2018, 6:00 p.m.
A Presidential plan to rebuild the country’s infrastructure would be appreciated – two in three Americans in the latest Economist/YouGov Poll believe the federal government has a major role to play in maintaining bridges, roads, and other infrastructure. Only 9% see no role for Washington. And the public wants to spend money to fix things. So does the President, who called for $1.5 trillion in infrastructure spending in his State of the Union address. Democrats, Republicans, and independents agreed in principle on this even before the speech, but Democrats are much more likely than Republicans or independents to indicate that they would strongly support those expenditures. The difficulty is that there seems to be no easy way to raise the money to pay for necessary improvements, even when payment would be limited to those who use a particular infrastructure. What about raising the gas tax and earmarking the tax to pay for fixing infrastructure? Only 31% say that is a good idea. Even those who support increased funding for infrastructure are evenly divided on this – though those strongly in support favor a gas tax 51% to 31%. How about raising taxes on airline tickets to fund airport repairs and improvements? Only 29% think that is a good idea. And there is little partisan disagreement on this: Republicans, Democrats and independents think this is a bad idea. 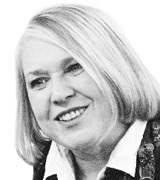 There could be new toll roads and congestion pricing for using them at peak hours. Most Americans (especially those in the Midwest and West) currently say they don’t have a toll road near them, so it may be that the concept of paying to drive on a road is not something they are accustomed to. Would Americans use and pay for a new toll road that saved them time? Only 18% overall said they would. Twice as many might consider it, however. Those who already have toll roads in their area are more supportive. Americans who have toll roads in their areas are also more willing to see congestion pricing – paying more to use certain roads at peak times. Just 30% overall say they support this proposal; that jumps to 42% among those who already have toll roads. Repairing infrastructure quickly could require reducing regulations. President Trump has suggested the process could be streamlined, and signed an executive order in August to that effect. Those changes could also affect environmental regulations for building. There isn’t much public support for doing that, except from members of the President’s own party. 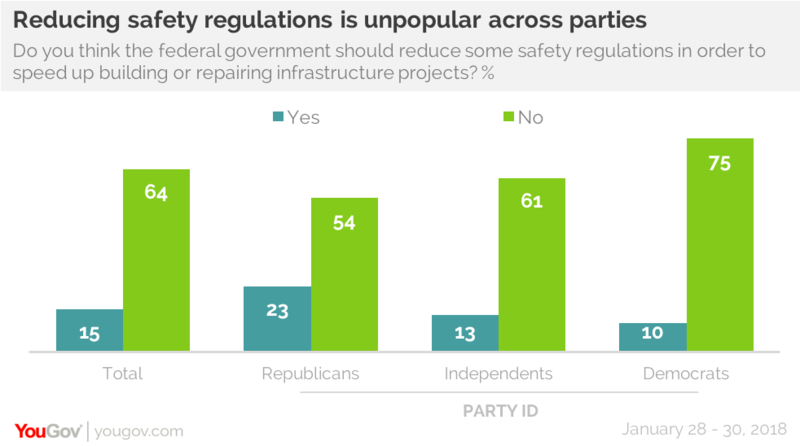 And across parties, there is hardly any support for reducing safety regulations in infrastructure building or repair. 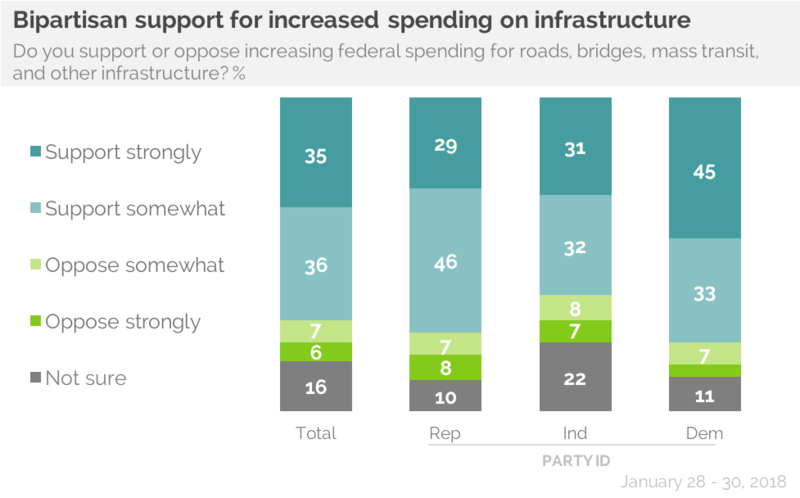 Majorities of Democrats (61%) and independents (54%) think there are two equal priorities when it comes to government funding for transportation: building and improving roads and building and improving public transportation. 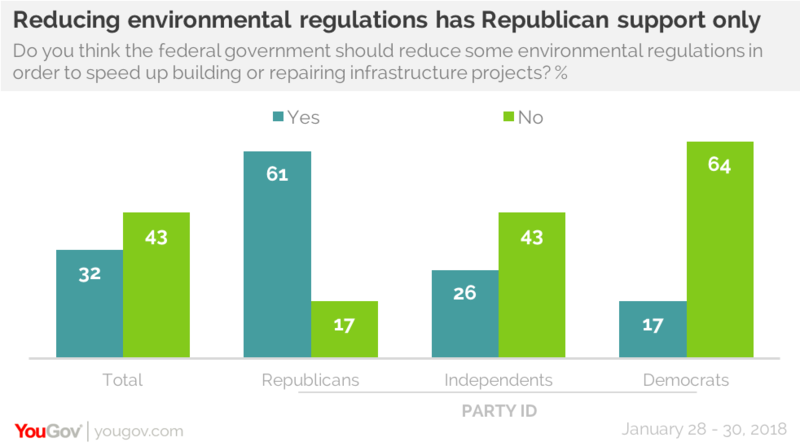 Republicans are more likely to prioritize roads. 41% of Republicans put that above public transportation. Still, 43% of Republicans give equal priority to both. Party differences on this may not be just ideological. Republicans and Democrats use roads and public transportation differently. Democrats, who dominate most urban areas, are much more likely than Republicans to use public transportation. 61% of Republicans say they never use public transportation, compared with 40% of Democrats. And 18% of Democrats say they never drive a car they own. That’s nearly twice as many as Republicans who claim never to drive their own car.